The original Housepaint exhibition was installed on the vacant site of the former Tent City in Toronto – where up to two hundred people lived until forcibly evicted in 2002. 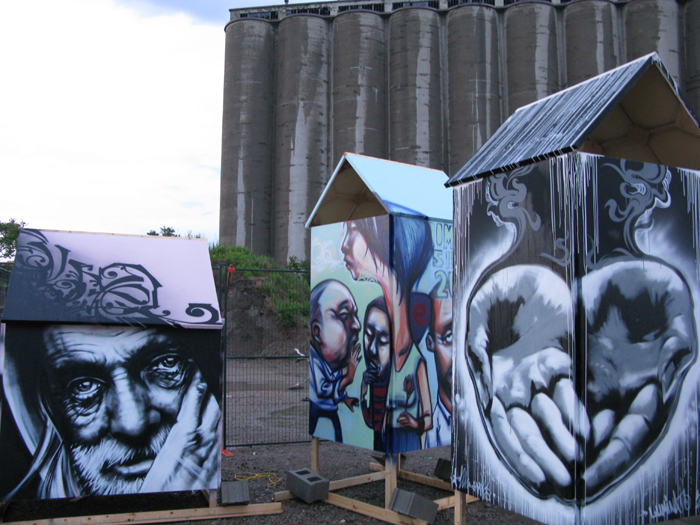 Over three days in June 2008, through storms, flood, and rainbows, ten of Canada’s top street and graffiti artists each painted a simplified canvas house to commemorate Tent City’s previous residents and homeless people who died on Toronto streets. The Housepaint project, curated by Devon Ostrom, was commissioned by Luminato Toronto Festival of Arts and Creativity in collaboration with Manifesto Community Projects, as part of StreetScape 2008. The sizes of the painted houses are based on the approximate income levels of people in Toronto, i.e. two low-, two high-, and six middle-class homes. At Tent City, the original site-specific installation was surrounded by construction fencing that excluded the audience and prevented them from passively viewing the artists at work. This temporary gated community of street artists included: Cant4, Case, Dixon/Royal, Dstrbo (HVW8), EGR, Elicser, Evoke, Starship (HVW8), Lease, and Other. The fencing surrounding the houses was covered in a wall of 560 small canvases that was painted as one piece by Daser (one of Canada’s first and most renowned graffiti artists.) On the back of each canvas was the name of one person who died on the streets of Toronto due to lack of shelter. These small 12 x 12” canvases completed the transient memorial and were given out during the last hours of Luminato 2008.